United Nations appeals judges on Wednesday upheld the convictions of former Bosnian Serb leader Radovan Karadzic for genocide, war crimes and crimes against humanity, and increased his sentence from 40 years to life imprisonment. THE HAGUE, Netherlands (AP) — Former Bosnian Serb President Radovan Karadzic, one of the chief architects of the slaughter and devastation of Bosnia’s 1992-95 war, was sentenced to life imprisonment Wednesday as United Nations appeals judges upheld his convictions for genocide, crimes against humanity and war crimes. Karadzic, 73, barely reacted in court as Presiding Judge Vagn Joensen told him to stand and then increased his original 40-year sentence to life. Survivors of the conflict who packed into the Hague courtroom’s public gallery, separated from Karadzic only by a wall of glass, erupted into applause then streamed outside weeping and hugging one another. The prosecutor who worked doggedly for a decade to convict Karadzic welcomed the rulings, saying they should prove even to Karadzic’s supporters back in Bosnia that he is no hero. The war in Bosnia was Europe’s bloodiest conflict since World War II, leaving 100,000 dead and millions homeless. In Srebrenica, the eastern Bosnian town that witnessed the war’s bloody climax when Serb forces slaughtered some 8,000 Muslim men and boys in 1995, relatives of victims clutched photos of lost loved ones, cried and applauded as they watched a delayed broadcast of the hearing. Similar scenes were seen in Sarajevo City Hall, which was rebuilt after being destroyed during the Bosnian war by Serb shelling. Robinson said Karadzic urged his supporters back home to avoid any violent reaction. 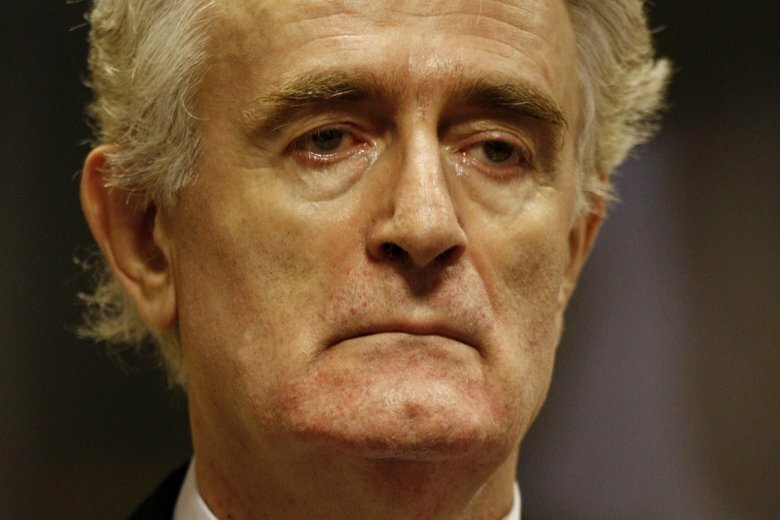 Karadzic is one of the most senior figures tried by the Hague war crimes court. His case was considered as key in delivering justice for victims. Karadzic’s wartime military commander Gen. Ratko Mladic is also awaiting an appeal judgment of his genocide and war crimes conviction, which earned him a life sentence. Both men were convicted of genocide for their roles in the Srebrenica massacre. Last week, Bosnian war wounds were revived when it was revealed that the suspect in the mosque shootings that left at least 50 people dead in New Zealand appeared to show admiration for Karadzic and his legacy. In a video, the self-proclaimed white supremacist is seen driving apparently on his way to the attack and listening to a wartime Bosnian Serb song praising Karadzic and his fight against Bosnia’s Muslims. Prosecutors had appealed Karadzic’s acquittal on a second count of genocide, which saw Serb forces drive out Muslims and Croats from Serb-controlled villages in a 1992 campaign. Judges on Wednesday rejected that appeal. Karadzic has always argued that the Bosnian Serb campaigns during the war, which included the bloody siege of the capital, Sarajevo, were aimed at defending Serbs. Now, he will very likely spend the rest of his life in prison. For some, even that is not enough.